Mrs. Jacqueline Creecy (Jackie) passed peacefully from this life the morning of March 26th. She was surrounded and supported by her loving family and caregivers during the last days of her life. Jacqueline was born on June 5, 1937 to Mr. and Mrs. Otis Richardson in West Virginia. Jacqueline received her formal education through Booker T. Washington High School, where she excelled in her studies. Jackie possessed a sweet spirit of elegance and beauty. She was a hard working mother who raised three boys. She was employed by Children’s Hospital of the Kings Daughter’s, where she served devotedly for 27 years before retiring in 1984. Upon retiring, Jackie became a member of Daughters of Radiant Temple #1200 and Past Matron of Excelsior Chapter #82, Order of the Eastern Star. In her leisure time, she enjoyed baking her highly desired desserts, shopping, decorating and gardening. Amongst all she loved helping others and spending time with her family and friends. Mrs. Creecy is predeceased by her parents, Johnnie Mae and Otis Richardson; husband, Emanuel Creecy; sons, Calvin (Mickey) and Gary (Jo-Jo) Skinner. 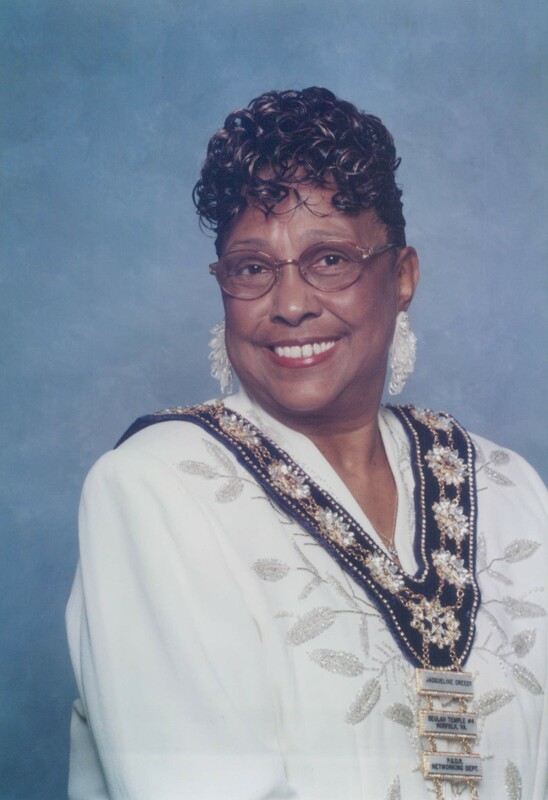 To cherish her memory she leaves one son, Freddie Skinner, two sisters, Lena Pulley and Sylvia Lightfoot; Special Friend, Patrick Jones; 8 grandchildren, 11 great grandchildren, 3 great-great grandchildren and a host of nieces, nephews, cousins and friends. We pause in humble submission to the will of the Almighty God! We are truly saddened to hear of the passing of Sister Creecy. She was a beautiful and sweet spirited lady with elegance. Prayers going forth for her family. Rest in Heavenly Peace our dear sister! I am sorry to hear about the passing of Mrs. Creecy. I had the opportunity to work with her for years at CHKD. She was one who was full of life and energy and very classy. May God be with her family during this time and comfort you. Prayers to the family!! At all times, you were a great neighbor and friend to my dad and I and for this I will forever be grateful Ms.. Creecy.. I will miss your cooking and our walks down the street. RIH where there is no more sickness or pain. Dgt.Jacqueline Creecy, will be greatly missed but her warmth, kindness, and gentle spirit will be remembered forever. I knew Jackie for many years when she worked on the Adolescent Unit at CHKD as the unit secretary. No matter how busy the unit was she always stayed cool, calm and collected. She was loved and respected by all who knew her. Elegant, chic and classy – That was Jackie. My sympathy and prayers go out to her family. Our prayers go out to you. You will never be forgotten. My condolences to the Skinner and Creecy family. I served in the Army with Jo Jo, and met Mrs. Creecy in 1980. Although my best friend from the Army has passed on, I remained in contact with Mrs. Creecy and Freddie, visiting last year. May God be pleased with her. Condolences to the Creecy and Skinner family. Mrs. Creecy was a very nice person. May God heal all greiving hearts. Auntie we will truly miss you, but through our un-shakable faith we no that “Peace” is with you always. We love you always! On behalf of Edward Fortson, Sr.& Family and the Greater Deep Creek Elks’ Lodge, I extend my deepest sympathy to the Creecy Family. I had known Ms Creecy for 37 years that I served at the lodge. I can remember how Betty Bussell solicited her delicious desserts for different Elks’ affairs that I too was able to enjoy. May the happy times and precious memories sustain you now and in the days to come. Previous Thomas Calvin Whidbee, Sr.